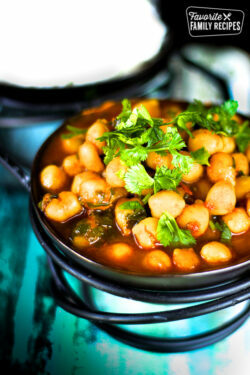 Curried Garbanzo Beans are another favorite side dish from our friend from India. They are loaded with Indian flavors. With rice it's a very filling dish! Soak them overnight then drain the water. Soak the garbanzo beans overnight, then drain excess water. Saute the cumin, onion, garlic, and jalapeño in the butter. Cook until onions are caramelized. Put drained garbanzo beans with about 2 cups of water, salt, Indian spice, and the tomato garlic sauce in a crock pot. Cook on low for about 8 hours. If the beans have not popped open and the sauce is not coming together you can move them to the stove top and cook them at a soft bubbly boil until the sauce comes together. If lacking in flavor, add more salt and Indian spice. You can also used canned beans of you are short on time. Serve beans over rice and with naan bread.